When I had the brainwave to move our bedroom across the hall, Matt didn’t understand why we couldn’t just stay in our current room. He went along with my plans, but he had one requirement: he wasn’t moving in until we had curtains. We haven’t had curtains on any windows in any room since we moved to the farm. With no neighbours, privacy is not a concern. However, our new bedroom is on the east side of the house. There are fewer trees on that side, so more light comes in the windows. At night, the lights on the barn and the driveshed and even headlights from the cars on the far-away road shine into the room. Plus, east equals sunrise. If we wanted to sleep past dawn on any summer morning, we needed curtains. But I wanted more than just curtains. I stumbled over Kristine’s window treatments on the Painted Hive and thought her solution was ingenious. (So I really can’t take credit for this idea). Kristine’s solution is a great mix of form and function. Function starts with a basic blackout vinyl roller blind, which I mounted above the window casing. The blackout blind is hidden behind a bamboo blind. Or what looks like a bamboo blind. In reality, it’s basically just a valance. I took one bamboo blind and chopped it to pieces. 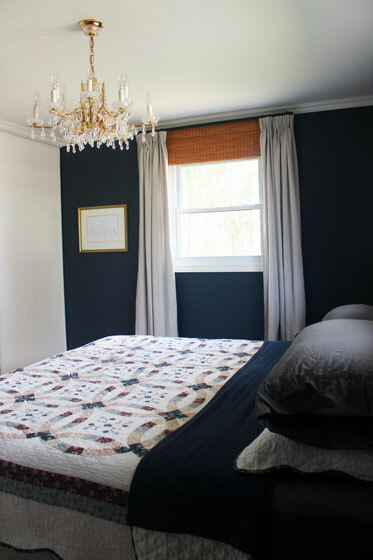 For the main window over the bed, I was able to use the full six foot wide blind, but I only wanted it to be about 16 inches long. To shorten it, I clipped the strings that hold the slats together and knotted the ends so that the blind didn’t fall apart. I’m not going to lie, tying hundreds of tiny strings into tight double knots was pretty tedious. For the smaller side window, I needed a narrower blind. 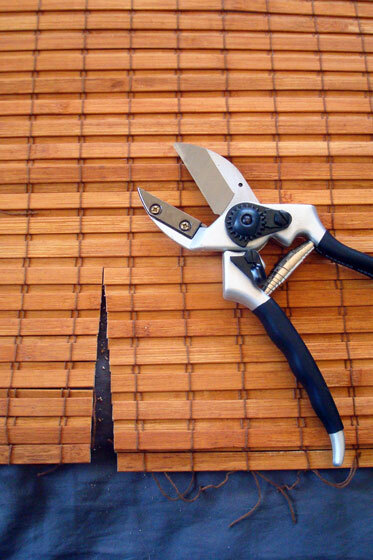 A set of strong pruning sheers and Matt’s strong hands clipped off the excess width. Then, I again cut the strings to give me a 16 inch length and tied another whole bunch of tiny knots. To put bamboo blind in place, I installed a double curtain rod just below the crown molding. I chose the Räcka and Hugad from Ikea. The bamboo panels just drape over the rear rod (I tied them in place) and hang over the top of the window. They hide the blackout blind and, because I hung them so high right under the crown molding, they make the windows look much taller. 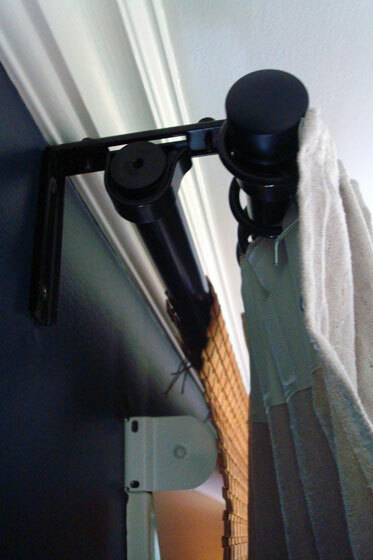 The front rod supports the dropcloth curtains that I made. The curtains are completely functional, but we don’t need to use them, thanks to the blackout blind, so they’re mostly just for form. They do hide the edges of the two blinds and help to block light from sneaking around the sides of the window though. I’ll be sharing more about some of the lessons I learned from making dropcloth curtains in my next post. I used the trick of hanging the curtains so that they fall just outside the window casing. This really does make the window look bigger in my opinion. 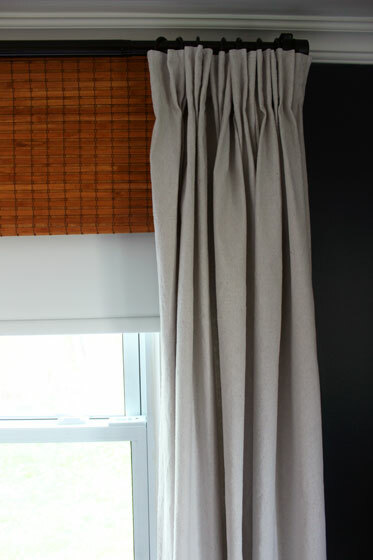 Altogether, the blackout blind, bamboo valance, double curtain rod and full length dropcloth curtains make for stylish and functional layered window treatments. Plus there’s the added benefit of keeping Matt happy. Happy husband. Stylish master bedroom. I’m all set. What are your master bedroom must-haves? Are you a blackout blind-er or a up with the sunshine-er? What’s your window treatment style? That’s a great combo. I’m needing something on my one, tiny window in the bedroom. Right now I just have a sheer and I’m up with the birds, like it or not! 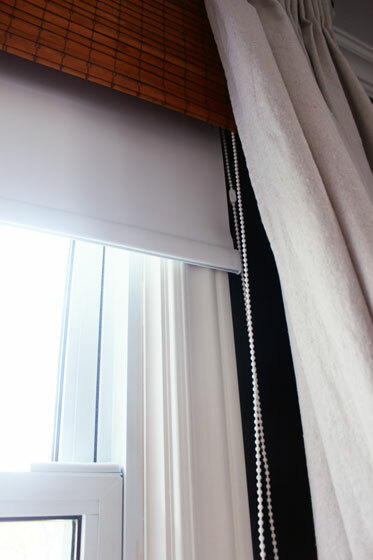 Blackout blinds/curtains will change your life… or at least your mornings!